Maybe you think that snails, clams, mussels, squid, and octopods are very different. Yet, they are all in the same category of animals known as mollusks and are structurally similar. Mollusks are some of the most well known of invertebrate sea creatures (there are over 50,000 species). Some are very rare and are only found in very deep-water. Mollusks have three body regions. 1. The head contains the "brain" and the sense organs. 2. The "visceral mass" contains the internal organs. 3. The "foot" is the muscular part of the body. Mollusks usually, but not always, have a shell, which is secreted by a body wall called the mantle. Many mollusks have a tongue of sorts, called a radula. The radula is rough like sandpaper. Mollusks have well developed body organs that are used in the respiratory, circulatory and nervous systems. The stomach-foots (class Gastropoda) contains about 70% of all mollusk species. 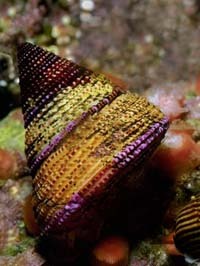 The stomach-foots include snails, limpets and abalones, which have shells. Slugs and nudibranchs are also stomach-foots, but do not have shells. A few stomach-foots are found on land. The many-plated or chitons (class Polyplacophora) have eight plates and look like pill-bugs (but pill-bugs are not chitons). Chitons crawl along rocks looking for food (usually algae). A chiton uses its radula (tongue) to scrape algae off rocks. It also has very hard teeth that are also used to scrape algae of rocks. These teeth are hard enough to etch glass! Embedded within their shells are primitive "eyes" that can detect light. Chitons are very, very slow moving. During a year, a chiton may move only ten feet! The bivalves (class Bivalvia) are very well known. They include clams, mussels, oysters and scallops. All bivalves have two shells (the name means "two shells"), and there are about 15,000 species. Most bivalves are marine, but about 20% are found in fresh waters. Most bivalves do not have radula because they eat by filtering water through their gills to obtain organic particles. Most bivalves attach themselves to something or burrow underground. Some scallops, however, do not attach themselves to anything and are able to swim by squirting water through their mantle. Pearls are made by most bivalves (not just oysters) and even some snails (such at the conch). When an irritant, such as a grain of sand, becomes embedded in the mantle of a bivalve, the creatures coats the irritant with the same material used to produce the lining of its shell. This makes the irritant smooth and less painful to bivalve. Over time, the irritant gets covered with more of the material, making a pearl! The class cephalopoda, meaning "head-footed," includes squids, octopods, cuttlefish and nautiluses. The feet, or arms, of these creatures are connected to their heads, not their bodies. The rest of the body is in front of the head. That's why they're called, "head-footed." The "feet" of cephalopoda are called "arms," not tentacles. The cephalopods appear to be very different from other mollusks, but physiologically they are similar. Cephalopods, like most mollusks, have a mantle, a mantle cavity, a radula, and a U-shaped digestive tract. Cephalopods have two kidneys and three hearts, which pump blue blood. They are carnivores that feed on fish, shrimp, crabs and other cephalopods. A bite from a Blue-Ringed octopus, found in the South Pacific, is almost always fatal to humans. However, it takes a lot of provocation to get any octopus to bite a person. Cephalopods have a more developed nervous system than other mollusks. They also have very well developed eyesight that is used in finding prey. Once prey is found, it is grasped firmly and eaten with a mouth located at the base of the arms. Cephalopods also have a parrot-like beak which is used in biting into prey. What is the Difference Between an Octopus and a Squid? An octopus has eight arms. A squid has ten: eight of the same length and two extra long ones used in grabbing prey. These extra two arms are called tentacles. The arms of both squids and octopuses have suckers on them used to latch onto prey. What is the Plural Form of "Octopus" ? Many people believe that the answer is "octopi." They are wrongthe correct answer is "octopuses." However, if you say "octopuses" many people will think that you are wrong and try to correct you. Try using "octopods," which is the proper plural form of "octopoda," the order of octopuses.